On a visit to my folk’s house a few days ago, my mom had been cleaning out some of the cupboards and found these boots at the back of one them. 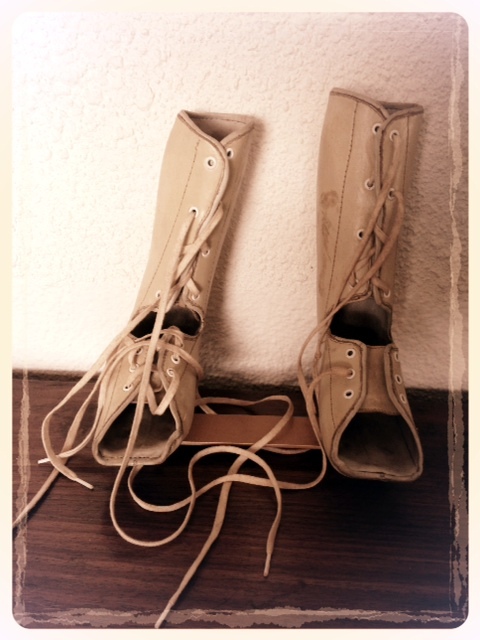 Not the latest fashion boots of the 1970’s, there were the Denis Browne splint boots to straighten a babies legs. Some of you might rightly think this is something out of a horror movie, quite rightly so! New born babies are small, fragile little beings and this looked just monstrous and it was something that my brother, as a baby, had to wear every night when he went to sleep. Once I had finished laughing at this whole picture in my head, I moved in to inspect these hideous looking boots a little closer. It had a steel rod attached to the sole of each boot with a dial to twist and tighten the boots in order to manipulate the legs. The boot itself is made of some ultra-hard fabric, almost as if it is a cast. I can only imagine how uncomfortable these must have been to sleep in night after night and not to have the freedom to move your legs at will. Upon some research I found out that this is called the Dennis Browne Bar, also known as the Denis Browne Splint or Foot Abduction Orthosis. Quite frankly the latter just sounds scary! The device was named after Dr. Denis John Wolko Browne (1892-1967), an Australian-born surgeon at Great Ormond Street Hospital in London who was considered the father of paediatric surgery in the United Kingdom. There are variations of this contraption and another one is little shoes on a rod, which is used to correct club feet, which is apparently a very common baby problem. I do hope that in today’s time they have found something a little gentler to use on the babies than these monstrosities of the 70’s! 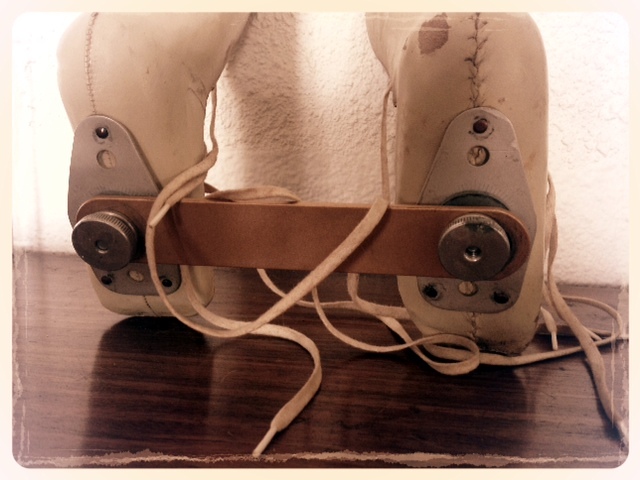 The back of the Denis Browne splint boots ~ The fabric they were made of is so hard it feels like a plaster cast. 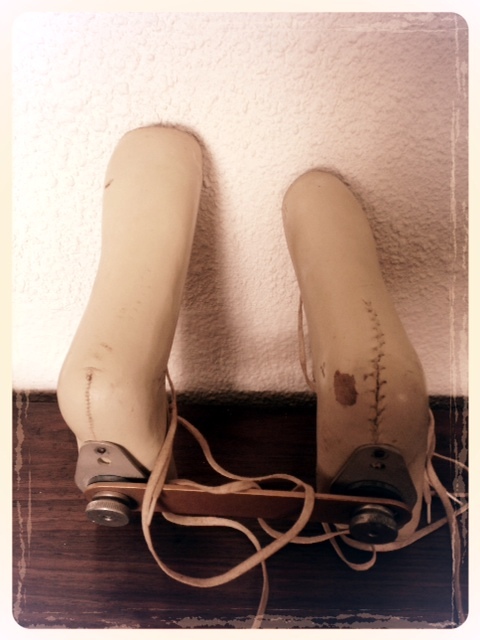 The Denis Browne splint had a steel rod attached to the sole of each boot connecting the two boots together, each with a dial to twist and tighten the boots in order to manipulate the babies legs. Although my brother had to sleep in this contraption every night to straighten his legs because as a breech baby he was doing all these crazy acrobatics on his way into the world, with one leg up by his head and the other leg out to the side somewhere! Not only did my poor brother have to endure wearing these rock-hard boots every night, he was born with a broken right arm, again due to his crazy acrobatics when entering this world! So a plaster cast on his arm from day one and these boots at night to pull his legs back into their proper position! Apparently all this was quite common with breech babies way-back when and these boots helped to straight the legs at night while the baby slept. In hindsight, with a broken right arm that is probably what guided him to become left-handed too. Yes, my brother obviously liked doing things the hard way right from the start! I can’t even imagine and quite frankly I don’t want to imagine what my poor mother had to endure, with arms and legs flailing everywhere, but thankfully she went on to have more children and that is how, luckily, 18 months later I made an appearance into the world. On time and head first! 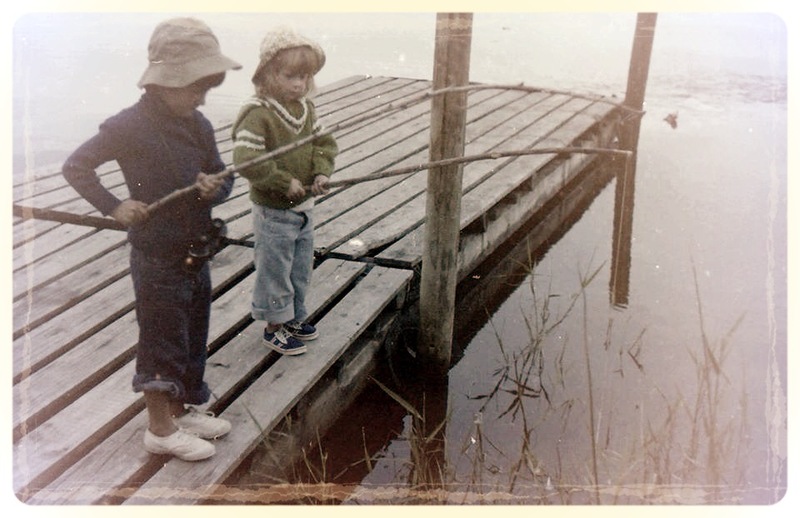 That’s me and my brother fishing back in the late 70’s ~ Note his nice straight legs all thanks to the Denis Browne splint! Needless to say, my brother did survive and he turned out pretty ok. He grew up with straight legs and has no problems whatsoever. All thanks to the Denis Browne splint! Previous A Post-It-Note for the Soul ~ Happy ChooseDay! Next Delights for the Eyes ~ Happy ChooseDay!